There has been a choir at Hereford Cathedral since at least the 13th century, producing beautiful music in the building’s unrivalled acoustic and glorious surroundings. 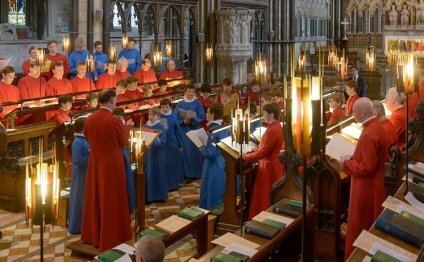 Today, the choir’s 18 boy choristers aged 7–14, together with the lay clerks (the gentlemen of the choir who sing the alto, tenor and bass parts), continue this tradition into the 21st century, providing music at the cathedral’s daily services and many special occasions throughout the year. They also reach a wider audience by singing in concerts, broadcasts on television and radio, recordings and international tours. The choir's most recent recording, released in July 2015, is a disc of Easter music on Regent, REGCD 478. There are also highly-acclaimed discs of music by William Byrd on Griffin, GCCD 4048, and music by Herbert Howells on Regent, REGCD 316, and Christmas from Hereford, REGCD 388. For several years the choir has given peformances of Bach’s St John Passion and St Matthew Passion in alternate years in the cathedral on Tuesday of Holy Week. It has also given four performances of Bach’s Christmas Oratorio since 2006. The choir has also performed at the Barbican Hall in London, with the City of London Sinfonia conducted by Harry Christophers. In 2005 the choir gave a concert in HM Chapel Royal, St James’s Palace, in the presence of TRH The Prince of Wales and The Duchess of Cornwall. Since 2010 it has sung an Advent carol service at the Guards' Chapel, London. The 2013 event took place in the presence of HRH The Princess Royal. The choir has appeared on BBC Songs of Praise several times, most recently for special programmes broadcast at Christmas 2007 and on Easter Day 2008. It also takes part regularly in BBC Radio 3’s weekly live broadcasts of Choral Evensong, including on Ash Wednesday 2012, when the Guardian described the choir’s performance of Allegri’s famous Miserere as sung ‘with glorious aplomb’.